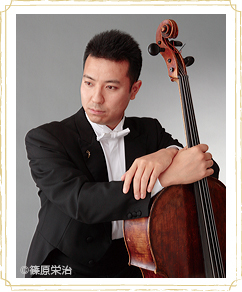 Born in a musical family and began to learn cello at the age of 14. Graduated from music faculty of Toho Girls’ Highschool (co-educational), then completed Ensemble Diploma course of Toho Gakuen College of Music. After that, continued to get training at the soloist course of Senzoku Gakuen University. Was successful in various contests such as 20th Kirishima International Music Festival (Special Encourgagement Prize), 14th Kawasaki City Music Contest (1st Prize), was accepted in the audition of 7th Okiden Sugar Hall New Face Concert and 12th All Japan Soloist Contest(Grand Prix). Joined as a guest and the first cello player at Tokyo Philharmony Orchestra, Kanagawa Philhamony Orchestra, Tokyo City Philharmonic, Kansai Philharmony Orchestra, and Yamagata Orchestra. Also took part in Japan Virtuoso Symphony Orchestra and Kioi Symphonietta Tokyo etc. many a time. In 2008 gave his Debut Recital at Tokyo Bunka-Kaikan sponsored by Japan Music Performance Association. Held recitals annually from the following year at Ginza Oji Hall, and got favourable reviews. Monthly Salon Concert Series in the title of ‘Salon de Violoncello’ at Yokohama City British Hall in the park ‘Minato-no mieru-oka ’ from 2009. Is actively taking part in as an enrolled artist at Music Activation program of Public Hall, ‘Onkatsu’. Also conducting, arranging, writing books and playing contemporary music, all of which are highly valued. Joins in: Tokyo Mozart Players, Super Cello Ensemble Tokyo, Tokyo Philos Quartet, Chamber Orchestra (ARCUS), Ensemble Dunamis, Chamber Soloists Kanagawa etc. Director of NPO’Hama’s Jack, Yokohama. A member of New Players Association.